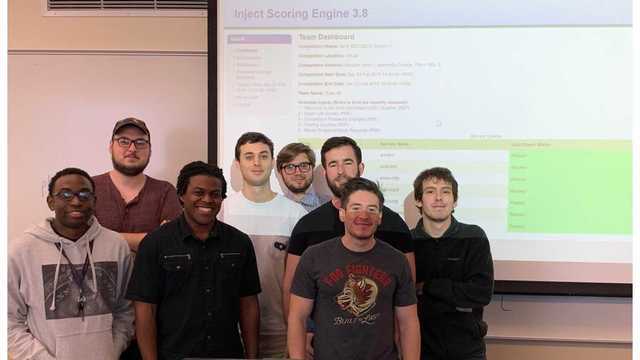 (COLUMBUS) WRBL - Feb. 23, Columbus State University's cybersecurity team came in second place at the Southeast Collegiate Cyber Defense Competition Qualifiers, held at Kennesaw State University. The team's victory at the qualifiers allows CSU's team to compete in the regional competition on March 9-10. The team, coached by Professor Yesem Peker from CSU's TSYS School of Computer Science, is co-captained by James Ericsson and Tyler Staut, with team members Brandon Corn, Matthew Bowen, Eloghosa Obasuyi, Justin Sewell, Mathew Warner-McKinley, and Christopher Wilson. The SECCDC has been held by KSU since 2006 and is currently organzied and operated by Mike Whitman, Ph.D., CISM, CISSP, Herb Mattord, Ph.D., CISM, CISSP, and James Blanton through the Coles College of Business Center for Information Security Education. According to the competitions promotional site it is meant to provide a way for students to "compete to keep the online services of their fictional companies active while resonding to the need for constant change."